Mobile's music scene has always been lively and even more recently, has become one of the top stops for many bands making their way across the country with dreams of stardom and adoring fans. The Alabama Shakes and Saint Paul and The Broken Bones are just recent visiting bands who have stopped - and come back through - Mobile. 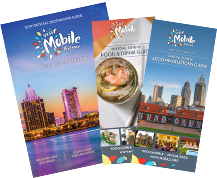 Our nightlife and entertainment options provide visitors a unique glimpse into the heart and soul of this lively southern city, with a nod to the spirt of Mardi Gras. Many bars in downtown Mobile can stay open past two am due to private club rules and a blocks-long entertainment district on Dauphin Street allows folks to walk from bar to bar with drinks in their hands. With so many concerts, festivals, parties and special events taking place all the time, it's kind of hard NOT to find something to do. Believe us, we may not sleep a lot, but we sure do have fun!